Another success story from the federal bailout during the financial crisis. Ally Financial is alive only because a $17 billion taxpayer bailout. And Thursday's initial public offering cuts the government's stake in the company in half to about 17 percent, as the Treasury captures nearly $2.4 billion in proceeds. Before being spun off from General Motors (GM) a while back, the company was known as GMAC. It's making money now, but still has lots of debt. As for taxpayers, we've now made a profit on the bailout of the company. 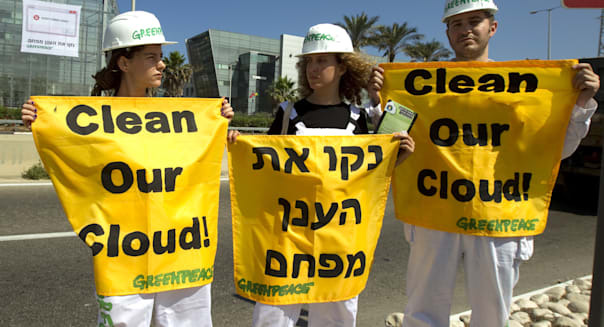 Jack Guez, AFP/Getty ImagesGreenpeace activists hold signs in English and Hebrew as they protest in front of the main offices of Microsoft in Herzliya, Israel, in 2012. Internet companies are generally considered cool and socially responsible, but the environmental group Greenpeace says Twitter (TWTR) and Amazon.com (AMZN) are among the "dirtiest" companies when it comes to energy use. It claims both have done a poor job of reporting their energy and environmental footprint. However, Greenpeace says Apple (AAPL), Google (GOOG), Facebook (FB) and others have done a good job in using renewable energy. Walmart (WMT) is going organic. The company is already the nation's largest grocer, and now it's moving to dominate the growing market for organic products. Walmart's line of Wild Oats organic products will cost about 25 percent less than competitive brands -- making them comparable to non-organic items. Here on Wall Street, the Dow Jones industrial average (^DJI) rallied 181 points on Wednesday, the Nasdaq composite (^IXIC) jumped 71 and the Standard & Poor's 500 index (^GPSC) gained 20 points. PC sales fell for the eighth straight quarter, as more and more consumers depend on tablets and other devices. The data tracking firm IDC says PC shipments fell by more than 4 percent compared to a year ago, but that's actually better than expected. Some corporate buyers replaced aging PCs that were still running on Windows XP, which Microsoft (MSFT) stopped supporting earlier this week. Finally, a survey by Visa (V) finds that prom spending by teens and their families is expected to fall by 14 percent from last year. It's still a major expense though. The average price for the tux or gown, the limo, tickets and dinner: a whopping $978.